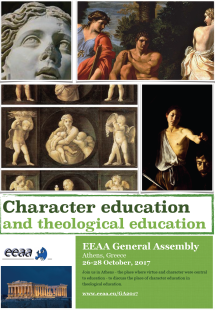 We are pleased to announce that the next EEAA General Assembly will be 26-28 October 2017 in Athens. The main topic of the plenary sessions will be, as requested by many of our member schools, Character Education and Theological Education. Please come prepared to engage with this probing topic. A team of experienced individuals from the EEAA network and council will facilitate our meetings and discussions. A number of seminars on other topics of relevance will also be held. Please see the EEAA 2017 General Assembly page for more information, a draft programme and registration information.